When Jacob Zakharyuk's first two shots from beyond the 3-point line missed the mark, the Damascus Christian junior feared the worse Tuesday night. 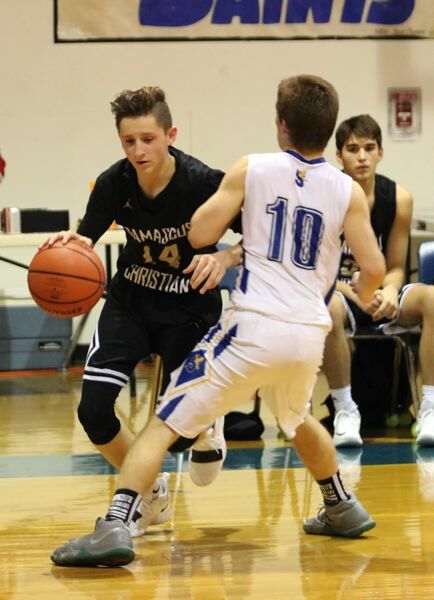 Zakharyuk knocked down five 3-pointers and finished with a game-high 20 points, leading the Eagles to a 52-43 Valley 10 League boys' basketball road win Tuesday at North Clackamas Christian in Oregon City. Jason Budey also scored in double figures for Damascus with 12 points to help the Eagles (9-1, 4-0 Valley 10) extend their longest winning streak of the season to five games and take over sole possession of first place in the league standings. North Clackamas' Braden Young finished with a team-high 16 points to lead the Saints (7-1, 3-1), who slipped into a three-way tie with Life Christian and St. Stephens Academy for second place. "I'm glad we got the win," Damascus coach Brad Patrick said. "It's always a battle with North Clackamas no matter what our records are or level of experience. Whenever we come in here, we know we're in for a battle." Budey then made one of two free throws with 1:10 left in the half and Zakharyuk added a 3-pointer -- his third of the game -- with 59 seconds remaining to send the Eagles into halftime with a 29-25 lead. Zakharyuk, the first player off the bench for Damascus on a night when three other Eagles were slowed with flu-like symptoms, puts more arc on his 3-point shot than just about any other player in the Valley 10 League, and maybe even more than any other player in all of Class 1A boys' basketball. He also benefited from North Clackamas' decision to play an extended 2-3 zone defense that maybe wasn't the best plan to try to contain a hot outside shooter. "This is actually the first game that we've played a 2-3 zone this year," Saints coach Grant Nelson said. "We've either played man-to-man or a 1-2-2 zone, but after scouting Damascus we didn't like either one of those defenses against them. I like how our 2-3 worked, with the exception of No. 14 (Zakharyuk) draining whatever he wanted to. "When you play zone, you go in knowing that if somebody gets hot shooting threes, you might have to live with that. And as a coach, I'll live with that before I live with guys getting to the basket and getting easy shots." Damascus never trailed in the second half, and in at least two instances when it looked as if NCC might mount a threat, Zakharyuk hit shots to give the Eagles some breathing room. Added Patrick: "Jacob did a great job. He's a good shooter and when he gets his opportunities, he's able to produce. It's hard for some teams to maybe recognize that he can shoot the ball before it's too late." After the Zakharyuk made it 46-36, NCC came up empty on its next six possessions and another three minutes also ticked off the clock. NCC's Jake Van Lieu snapped the drought when he made one of two free throws to cut the Eagles' lead to 49-37 with 2:12 to play, but at that point, it was too little, too late. "I think we could have made a few more shots and we had a few too many turnovers," said Van Lieu, who finished with five points. "We have a bit of inexperience on our team this year, but I think this was a huge learning experience for our team as a whole and every player on the team got to grow. "Even if we lost, it was a really good experience for us and we'll be ready to match that same intensity next time." The loss snapped a seven-game winning streak -- NCC's longest win string to open the season since the Saints opened the 2005-06 season with nine consecutive wins. "Coming into the game 7-0, I don't ever want to say it doesn't mean anything, but we hadn't faced great competition to this point," Nelson said. "So, coming in and starting two freshmen, I wanted to think that we could compete, but you never really know until you get out there and do it. "To be as competitive as we were at this point in the season, I was thrilled. Obviously, we have to clean some stuff up. We've got a lot of room for growth. Damascus is a very good basketball team, but I was really happy with a lot of the stuff that we did." 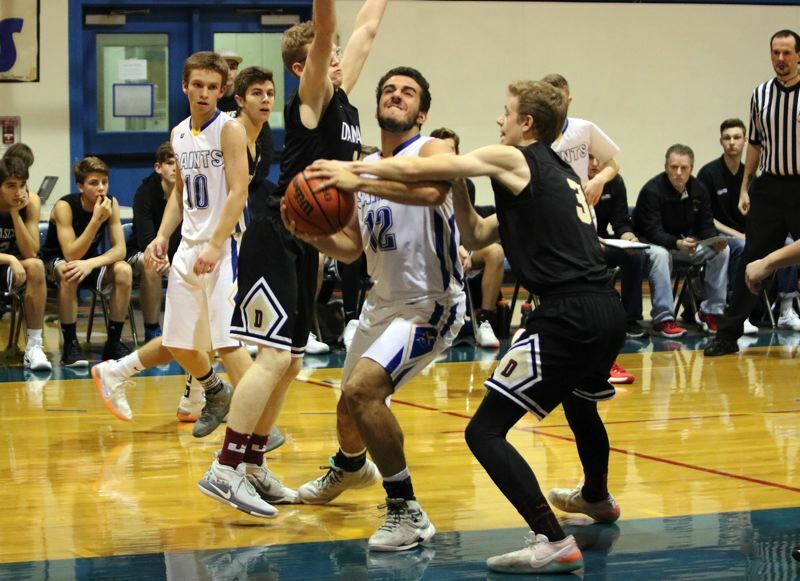 NCC has a non-conference home game scheduled Friday against South Wasco County, and then both teams return to league action on Jan. 3 when Damascus travels to Portland Waldorf in Milwaukie, and the Saints visit Open Door Christian Academy in Troutdale. "I've been coaching long enough to know that winning and losing in December is definitely overrated," Nelson said. "I've played great this time of the year and then not so great at the end of the year. And the other way has happened, too, where we started off struggling and then you end up playing great. "So, really if we can keep improving and keep building, I'm not too worried about our record at this point. I just want to see us get better, and I think if we do, our record will take care of itself."